What: Nation’s largest farmers’ market. You’re probably going there anyways. Who: Johnson Brothers Coffee, Fried and Fabulous, Banzo, Carnacas Empanadas, SoHo Gourmet Cusines, Umami and more! What: City sanctioned gathering of carts. Encourages meeting your neighbors for a night out and dinner. Where: Three neighborhoods throughout Madison: Westside at Meadowood Shopping Center, the Southside at the Villager Mall and on the Northside at St. Paul Lutheran Church. Bonus: Vendors are asked to offer at least one menu item that is $3 or less. 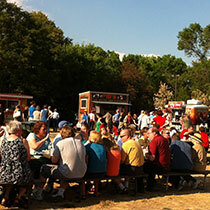 What: Groups of food carts offering dinner in neighborhoods. Organized by food cart owners. What: Carts serving lunch in Research Park on Wednesdays. What: Carts providing after-bar food and satisfying late night cravings. More Information: Check the individual carts’ Twitter feeds and Facebook pages. Be sure to check out the links on “More Information” for any changes in schedules or weather. In addition to these regularly scheduled food cart eating opportunities the carts can be found at fests, block parties, fairs and just about anywhere a group of people gathers in the Madison area. Plus, a few of them like Good Food Cart and Banzo deliver. Whew. Now there are no valid excuses for skipping out on the wonderful food cart scene in Madison. Happy Streeteating!